So, How Does a Chimney Work? When people report problems with the performance of their wood burning, (or fireplace) systems, the cause is often traced to the chimney. If you are building a new home or remodeling an existing one, selecting the correct chimney and designing the layout is critical to safe performance. And of course, knowing how chimneys work will be very useful in the day-to-day operation of the appliance. Chimneys operate on the principle that hot air rises because it is not as dense than cold air. 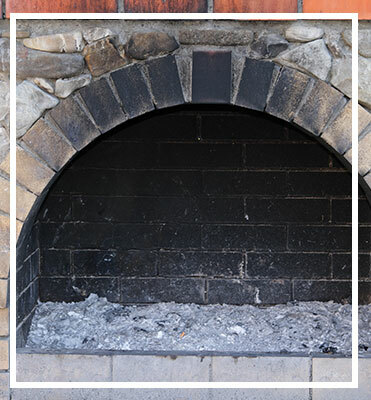 When a chimney is filled with hot gas, that gas tends to rise because it is less dense than the air outside the house. The rising hot gas creates a pressure difference called draft which draws combustion air into the appliance and expels the exhaust gas outside. The red figures in the body of the table are the number of pascals (Pa) of pressure difference that result from the intersecting temperature difference and stack heights. One Pa is equal to 0.004 inches of water column (“wc). be sealed to prevent leakage (on the sides as well as on the top, with a chimney cap). It’s essential to realize just how important proper chimney or fireplace installation and operation truly are to the well being of your home and family. Trust us it can make a BIG difference! For any help detecting if your chimney or fireplace is in solid, working condition, simply give us a quick call today – and we will be glad to assist you.